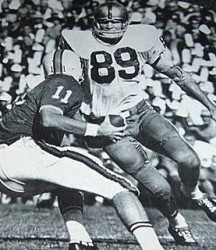 Ted Hendricks, born in Guatemala City, Guatemala was a three-sport athlete at Hialeah High School. He was a three-time All America choice at defensive end for the University of Miami Hurricanes. Hendricks was drafted in the second round of the 1969 draft by the Baltimore Colts and became a part of a 4 Super Bowl winning teams. Along with the Colts, Ted also spent significant time with the Green Bay Packers and Oakland Raiders. 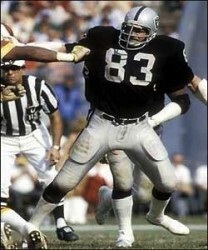 Ted was noted as being a strong, fast and devastating tackler. Nicknamed “The Mad Stork” because of his frame and playing style, he had an outstanding knowledge of the game and durability. He scored touchdowns on an interception, a fumble return, and a blocked punt. Although sacks were unofficial until Hendricks’ last two seasons, he unofficially recorded 60.5 career sacks with a career-high of 8.5 in 1980. His pass coverage was represented by the 26 interceptions and over 95 passes deflected in his 15 seasons. He played in 215 straight games until his retirement in 1983. 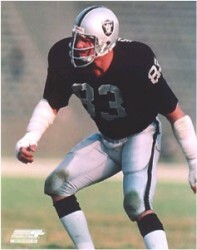 Ted Hendricks was enshrined into the National Football League Hall of Fame in 1990.